I've been sleeping on a vast range of mattresses and putting them through their paces to bring you a true picture of how comfortable each one is and how much support it provides. I've also roped in my husband Nick to create a balanced view of what each mattress is like for women (so often the purchasers) and men, persuaded friends and family to try them out, and have conducted some semi-scientific testing so that you can buy your mattress online with confidence. If you're looking to find the best mattress for your needs, you'll find plenty of choice in our mattress guides – but don't miss our deep reviews first. Here, we review the Otty Hybrid mattress, after a week spent sleeping on it. Who will the Otty Hybrid mattress suit? Cool customers seeking a non-sweaty night’s sleep + space-hogging couples. What's the Otty Hybrid like to sleep on? Like the other ‘new generation’ Hybrid mattresses on the market, the Otty is a problem-solver. Its aim is to combat the overheating and unresponsiveness issues of a pure memory foam mattress, while introducing better comfort levels than you’d typically get from a fully-sprung, foamless option. We’ve tried the Simba Hybrid and Dormeo S-Plus Hybrid, which we both liked but definitely noticed a squishy-factor that was slightly too sinky for our tastes (reminder: our usual mattress is a fairly firm pocket sprung). The reason I am telling you all this? Well, right from the get-go, the Otty feels more robust. When you first lie down, you can tell the springs are there, but that memory foam also registers well, too. Our first reaction definitely involved the ahhh-factor (not to be confused with the argh-factor) everyone wants when they climb into bed at the end of the day. It may have helped that the Otty testing followed a long stint on a fairly lifeless all-foam number. And that’s an important point about mattress testing, your first response is always a reaction to what you’re used to. It’s a bit like switching cars (bear with me); the first few times you get behind the wheel everything feels alien and wrong but your body soon adjusts. Hence the reason most manufacturers insist on a decent trial period. Anyway, back to the Otty. We trialled this mattress for seven nights and I would have kept it for longer if there wasn’t another test victim waiting in the wings. It was basically made for me. Not too soft, I don’t like to feel trapped while I sleep, but not too firm either – none of that bruised feeling you sometimes get on your hips or shoulders when there’s no ‘give’. Nick, who is heavier (and bigger all-round to be fair) said it was slightly too squishy for him, but firmer than the other Hybrids we’ve tested and he also preferred it to the all-foams (but ultimately I don’t think I’ll ever get him to part from our traditional pocket sprung, sigh). The Otty is the proud owner of a Which? Best Buy, but one of the few negative points the consumer testing behemoths did pick up on was a small degree of motion transfer. With this in mind, Nick and I paid particular attention when getting in and out of the bed and, in my case, 'generally flailing around' (his words). However, while I could see what the Which? team were alluding to – movement does register but no more than on a normal pocket sprung – I didn't find the motion transfer excessive. My general test gauge here is ‘did it wake me up?’ Happily it passed with flying colours. Moving onto firmness (see graph below), Otty rate the Hybrid medium to firm – giving it seven out of 10 to be precise (with 10 being hardest). As far as Nick and I are concerned, that assessment is spot on. Our increasingly knowledgeable team of testers (three male, three female, ranging from 10 to 17 stone), who are now so mattress-savvy I could probably hire them out to manufacturers’ R&D departments, all pitched their ratings in at around the seven mark, too (and before you ask, none of them are Len Goodman, sadly). So there you have it, if you want firm but not too firm, Otty is your man. The weight test (below) supported our firmness verdict, which is always a relief, with our trusty weight just about pushing 7cm on the ruler. Unusually, the weight recorded pretty much the same measurement both on the side, and in the middle, a feat likely achieved by the mattress’ extra-firm side support panels, which are designed precisely to make the whole surface usable. Basically, you can expect to enjoy the exact same level of support wherever and however you lie down – starfish included. The posture test (below) was similarly impressive, with the laser cutting a fairly straight line across the dots on Nick’s spine, suggesting that he is well supported at the key pressure points of hips and shoulders. Indeed, despite moaning about squashiness, Nick admitted that the only time he woke up aching was after a particularly arduous session with his squash coach (I try not to delve too deeply there). How does the Otty Hybrid rate online? The Which? Best Buy accolade has already been mentioned, and you can also add a Best Buy from Expert Reviews and a ‘recommended’ from the Good Housekeeping Institute to Otty’s trophy cabinet. Over at TrustPilot, a similar tale of happy customers unfolds, with 83 per cent of the 2,581 polled rating it five star. Looking at the reviews from the 3 per cent who gave it one star, the moaners are mostly moaning about credit issues and delivery. However, it does appear Otty are proactive with resolving complaints, and are quick to get in touch with any unhappy customers. A 100-night trial, 10-year guarantee and free delivery. Keep an eye on the Otty website for discounts – especially around key times like Bank Holidays and Black Friday. There are also deals to be had on Otty’s Deluxe Pillows if you’re looking for the full Otty effect. Is the Otty Hybrid worth it? Yes, 100 times, yes! I would genuinely rate this a great all-rounder that is not too hard, nor too soft. If I had to try and find fault, I’d probably echo Which?’s second (and only other) complaint, which was that it doesn’t have any handles to help with the monthly rotation that’s required to ensure longevity. But that seems to be a common issue with these modern bed-in-a-box mattresses; they're chock-full of high-tech features, but simple handles are rarer than hen’s teeth. One of the biggest bonuses of the Otty for me, was its coolness. We had to tape up our bedroom window in October, to stop swarms of cluster flies hell-bent on moving in (they were squeezing through the gaps in the UPVC frame, in droves, and then dying on the carpet – totally disgusting) so it’s been getting pretty muggy at night. However, the night we switched to the Otty, I definitely felt cooler and, for the first time since taping the windows, didn’t wake at 3am in a sweaty mess (the weather outside hadn’t changed significantly, in case you have a suspicious mind). Here goes, from the top: a 3cm-thick layer of Cool Blue Gel memory foam, which has cooling gel and pin holes to keep fresh air circulating. Next is a 3cm-thick reflex foam, which is all about stability and support. The core of this mattress is filled with 2,000 (in the king size version) pocket springs. At 14cm tall, they are significantly bigger than some of the other hybrid mattresses we’ve tested, which tend to have loads of tiny, coil-like springs. 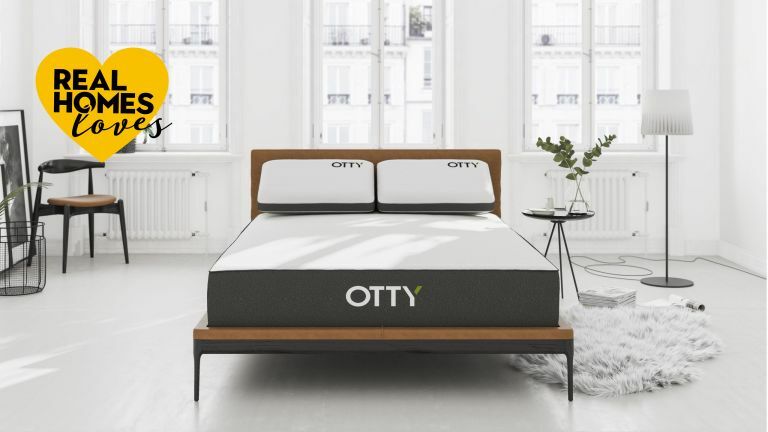 The size and strength of Otty’s springs are more akin to those found in a traditional pocket sprung mattress in fact and, says Otty, is the secret to its supportiveness. I don’t generally like to repeat the official hype, but in this case it rings true so is worthy of mention. Finally there’s a 5cm-thick high-density foam base, which aims to provide longevity and prevent dips. Oh and the cover is removable and washable – bonus. The ordering and delivery was easy enough but there was a long old delay of about a month, which I was made aware of from the outset. Otty use the delightfully named delivery firm Keen & Able, and I received several texts from the driver, telling me how he was getting along on the day, with the last one 40 minutes before he arrived. This kind of precision is very handy if you’ve got a few errands to run. Linda Clayton has been writing about homes and interiors for nearly 20 years, working for publications such as The Guardian, The Telegraph, Homes & Gardens, Country Homes & Interiors, Real Homes, Ideal Home, Livingetc and House Beautiful. Linda and her husband spend between five and 10 nights sleeping on each mattress.